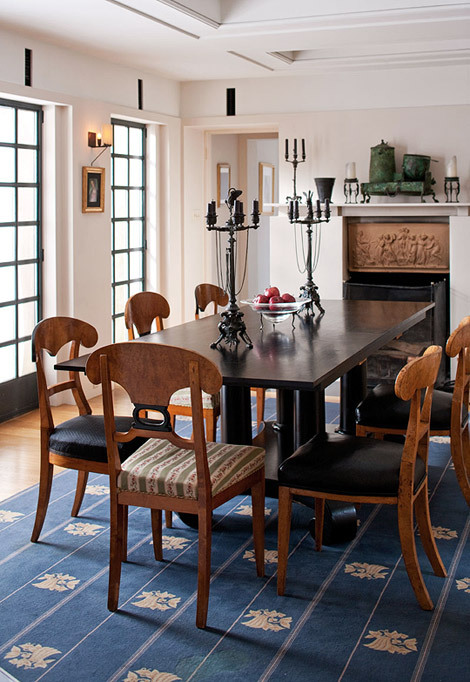 Biedermeier style is one of the most chic design periods. 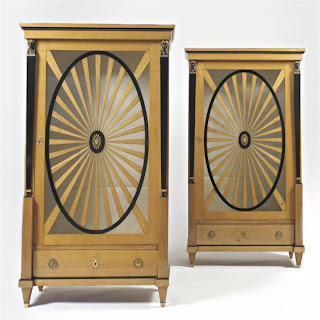 The period for Biedermeier is 1815 - 1848 in Central Europe. 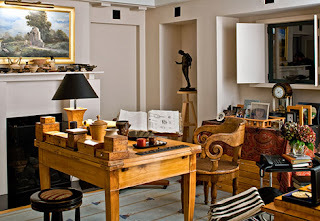 The warm brown wood with the ebonized touches make it work in a modern setting. The architect Michael Graves has a home chock full of Biedermeier furniture. 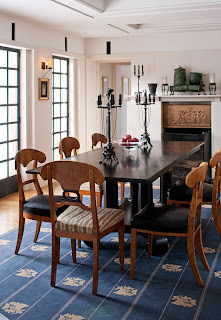 The chairs in the dining room are circa 1820. They have that beautiful wood characteristic of the style, and wondferful curved backs. So simple but so stylish. The commode in the bottom photo is circa 1830, and has a very architectural design. The Wiener Werkstatte chair works with it perfectly. 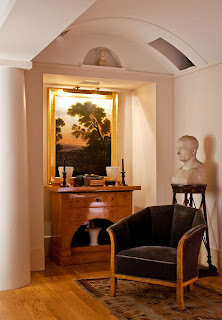 The chair in Graves' study has wonderful curved arms that make the look. 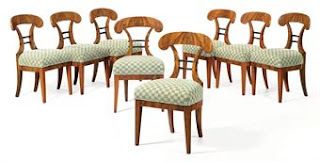 This set of eight Biedermeier walnut with ebonized side chairs are quite similar to the ones in Michael Graves' dining room. These sold at a Christie's auction in New York for $5,000. They are 1st quarter 19th century. I would reupholster in a black fabric for the ultimate chic look! This is a set of eight Biedemeier side chairs coming up in a Bonhams auction in New York April 13th. 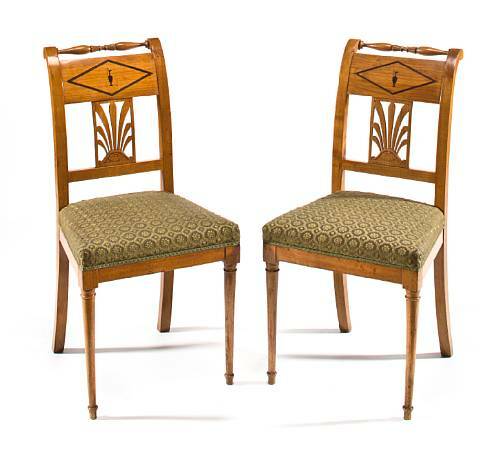 These are Lot 2189, and are described as inlaid and carved cherrywood side chairs from the 1st quarter of the 19th century. They have an auction estimate of $2,500 - $2,500. These lack the curved back detail, but the carving and the ebonized inlay decoration are exquisite. I couldn't resist these fabulous cabinets! 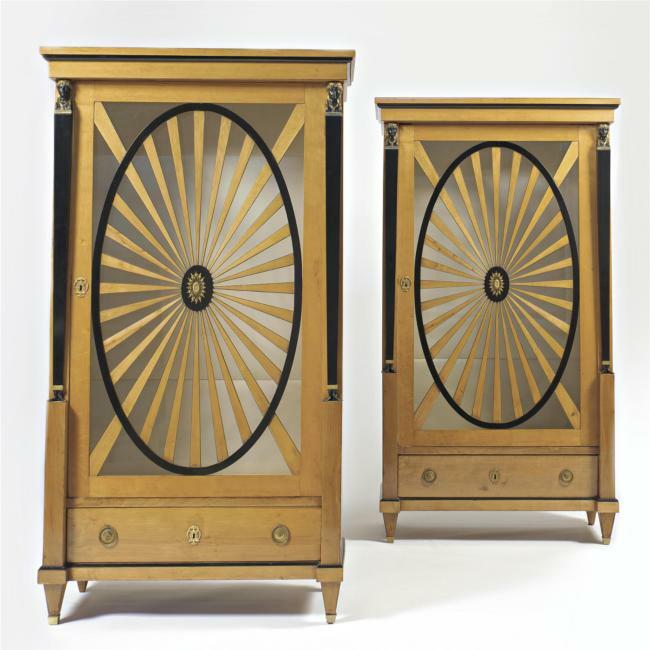 These were made circa 1820, and are made of ebonized wood, fruitwood and patinated bronze decoration. They sold at a Sotheby's auction for $10,000 off an auction estimate of $10,000 - $15,000. They are quite special. 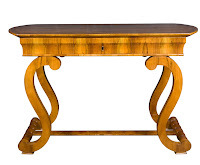 This lovely side table has all the wonderful chic simplicity we want in Biedermeier. This is a birch and ebonized wood table from the 2nd quarter of the 19th century. It was described by Sotheby's as probably Austrian. It sold for $1,560 off an estimate of $1,200 - $1,800. The shape is fabulous, and couldn't you see this in a small entryway or in a place of prominence in the living room! This Biedermeier fruitwood center table stands out because of the wonderful curved legs. The wood is so warm, and the shapes so elegant. 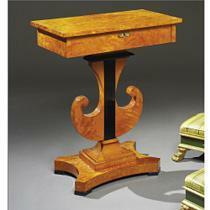 This table sold at a Doyle New York auction for $2,000 off an auction estimate of $2,500 - $3,500. 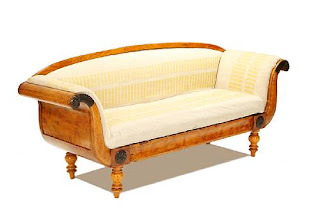 Sofas of this period are very architectural. This satinbirch example has terrific curved arms, and ebonized wood details. This is being offered in a Bonhams London sale May 10th (Lot 261) with an auction estimate of 800 - 1,200 GBP ($1,300 - $2,000). Again, I would reupholster in black for a graphic effect. This is a stand out! Biedermeier combines elegance with great styling. The warm woods, the subtle decoration of curves and ebonized inlays make the style so modern. Michael Graves should know!